This year we decided to get together in Palm Springs, CA, because Tonya has a time share there. It was hot in Palm Springs. I’m from Arizona; I should know. Anyway, there we were, a six-pack of wonderful girls looking to relax, catch up, eat good food, and not pass out from the heat. What we really needed for starters was something cool to drink poolside. Bonnie had made each of us a beautiful princess wine glass…so we all agreed they’d be perfect for holding a nice cold and fruity sangria. So the big question was, who had a good sangria recipe without all the extra sugar? We all looked at Lucy. Lucy and her boyfriend Dave own Petrini’s, a Downtown San Diego restaurant with a gluten-free menu in Little Italy. Lucy just smiled and said, “No soda pop, no processed juice, no sugar? – no problem!” I always knew she was brilliant! So we got busy making Lucy’s special sangria and sat by the pool. Actually we sat in the pool since its was 105 degrees. Her Sangria was amazing…so cool and refreshing! Thank you Lucy! While we sat there sipping, my mind started turning. I thought, this paleo-friendly sangria would make an awesome popsicle! So we made them. Presto! Paleo Sangria Popsicles! 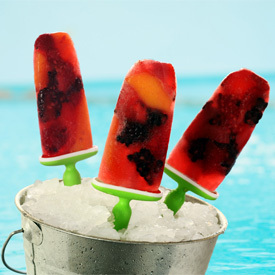 With the Fourth of July just around the corner, these ice-cold and delicious sangrias on a stick could be a big hit if you plan on entertaining. The frozen version is so good, but you’ll also love Lucy’s sangria in a pitcher too! I’m just a lucky girl to call Lucy my friend along with the rest of the six-pack. Until next year girls! Cheers! Or as Bonnie would say, Clink! P.S. 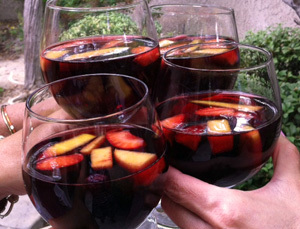 A special thanks to Bonnie for snapping these great table shots of the sangria and wine glasses! *Note: Harder fruit stands up better if you're making a pitcher instead of the popsicles and want the sangria to last in your refrigerator more than a couple of days. Mix the wine, brandy, orange juice and fruit together. 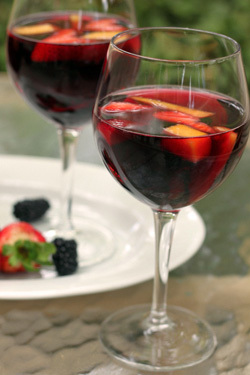 If you will be drinking this sangria, fill the glass about 2/3 full then add a little club soda. 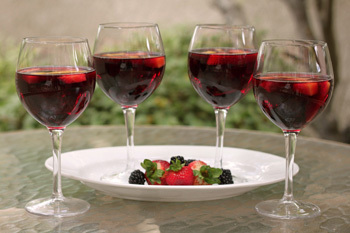 *Note: Don't add the club soda to the pitcher of sangria all at once – it will go flat over time. Do it by the glass as you serve it. If you're making the sangria pops, you can leave out the club soda (unless you want to dilute it a little). Fill your popscicle molds. Freeze until solid. Sounds Yummy, but, do these really freeze with the brandy in it? Oh yeah, and great idea, Trina. to make popsicles with it, I want one right now. That was some good stuff, like Bonnie said, big girl fruit punch! Loved your recipe, Lucy! You know it girlfriend! :) your pics are awesome, even with the limited time you had to take them. You little rock star. A Special Cream Makes This One Just Peachy! Goodbye McMuffin, Hello Paleo Stack!